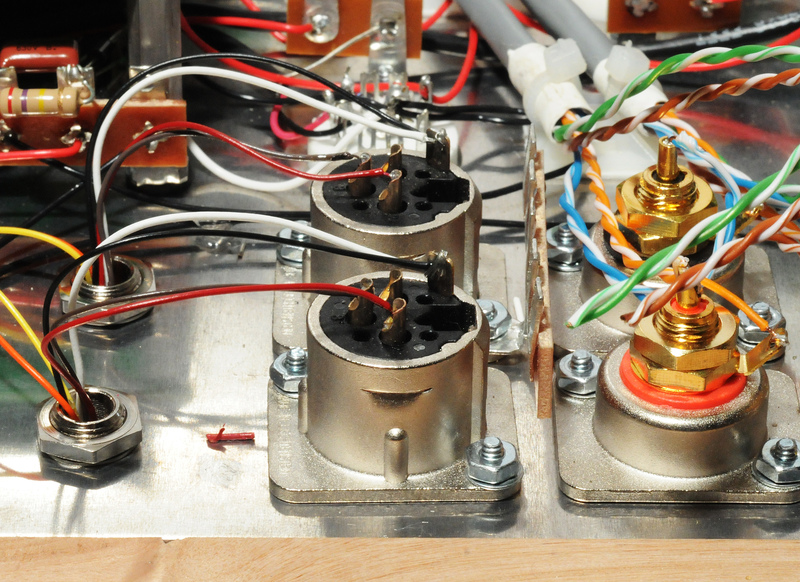 Here is a quick little project that I pulled together so we could see just how power hungry headphones (like Hifi Men and their ilk) sound on our lovely sounding directly heated triode amplifiers. With the DC filaments on the StereomourII, the results were quite nice. The parts I used are all available from a variety of online vendors. I wasn’t taking notes or pictures when I put this together, but this is an easy enough project to put together once you see the parts for yourself. First order up the parts. 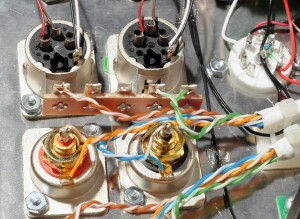 I used these part numbers, but you could use any quad microphone cable you like, different connectors, et cetera. Markertek sells all of these exact model numbers; other vendors may or may not carry all three. Strip the outer jacket and shielding (braided copper if the Mogami is used) off each end. I did about 7″ (178mm) on one end, which is long enough for the ends to reach the binding posts on a Kaiju. The other end I stripped as needed by the plug, so it may vary. Disassemble the TRS jack. The one shown has a screw as well as the screwed on strain relief. Slide the strain relief and connector body over the short stripped end. 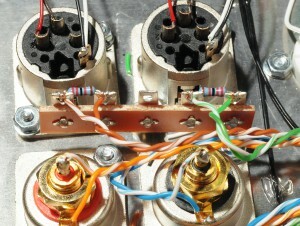 Strip the blue and clear wires on the short stripped end about ¼” (7mm). Solder one blue wire to the tip lug, and the other to the ring lug. Solder both clear wires to the sleeve lug. Strip the blue and clear wires on the long stripped end about ½” (14mm). Use the continuity checker on your meter to determine which blue wire is on the right channel (ring terminal). Mark that pair with tape. Confirm continuity on the left channel (tip terminal) and grounds while you’re at it. Disassemble the banana plugs. The ones shown are held together with a black screw in the plastic body. Once the body is apart, you insert a small flathead screwdriver into the individual bananas to loosen a setscrew that will secure the wire in a small hole. I found the fit to be better if the end is folded over on itself before inserting. Take the pair of wires marked as belonging to the right channel and insert the blue wire into one post and the clear wire into the other, securing with the setscrews. Assemble the red banana plug around these connections. 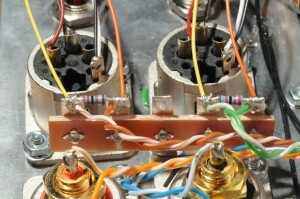 Mark the blue wire with a “+” and the clear wire with a “-” on the outside of the the plug. Repeat for the left channel. I recommend using the same positions for the + and – bananas as used on the right channel, since the black plastic is hard to mark. That’s it. 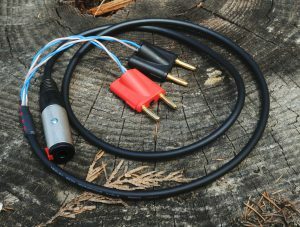 Of course, you could use whatever cable dressing you like (tech flex, cable pants, heat shrink, et cetera), but that’s all you need to do to make a functional cable. 1) There is no protection of the headphones provided as built. Use this adapter at your own risk. Headphones can easily be damaged by a strong signal; do not hot swap interconnects with headphones on your output! Use of this kind of device with high powered amps is not recommended. 2) We do not recommend this for AC heated SET amps. 3) Directly heated triodes are a microphonic; you will hear some ringing when you touch the amplifier or the surface it rests on. 4) You certainly can use this with low impedance, high efficiency headphones. You will hear some tube rush and other noise. 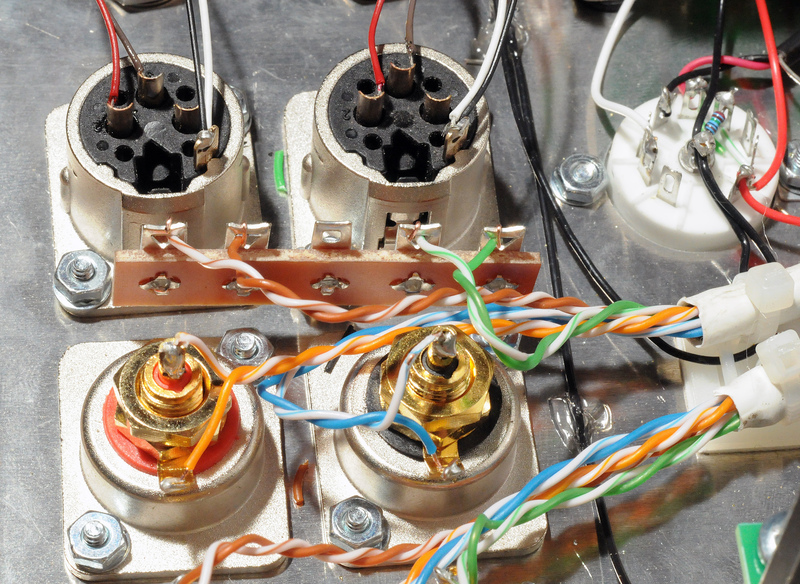 Wire your output transformers to the lowest impedance for the best signal-to-noise ratio. 5) Most important! This project is presented as a DIY solution to a problem. That means •Do •It •Yourself!. There is no technical support offered for this project. There is no advice offered for this project. There is no recourse if you screw it up (see note 1). It costs about $15 dollars to do this project with the pieces suggested. 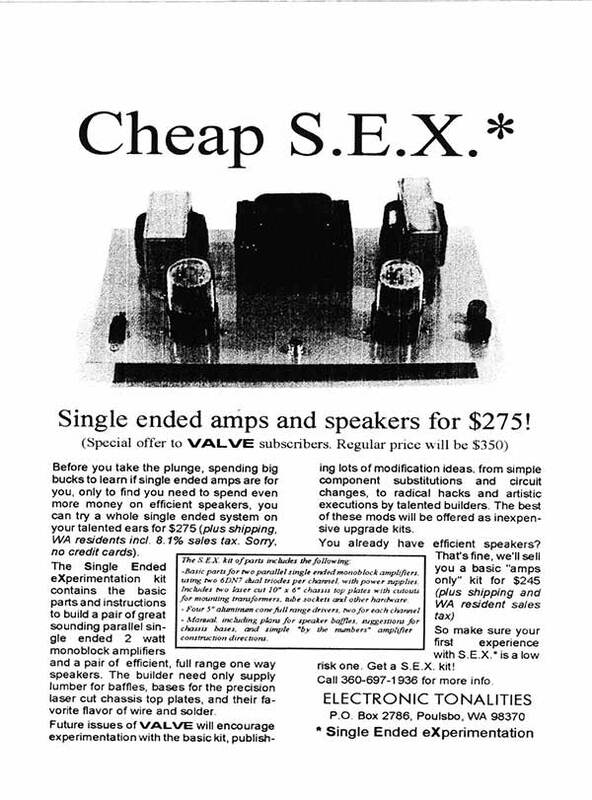 You could probably get that down to just over $5 if you use cheaper parts and a short cable. Time investment is minimal as well. If you want to know how it works, TRY IT. 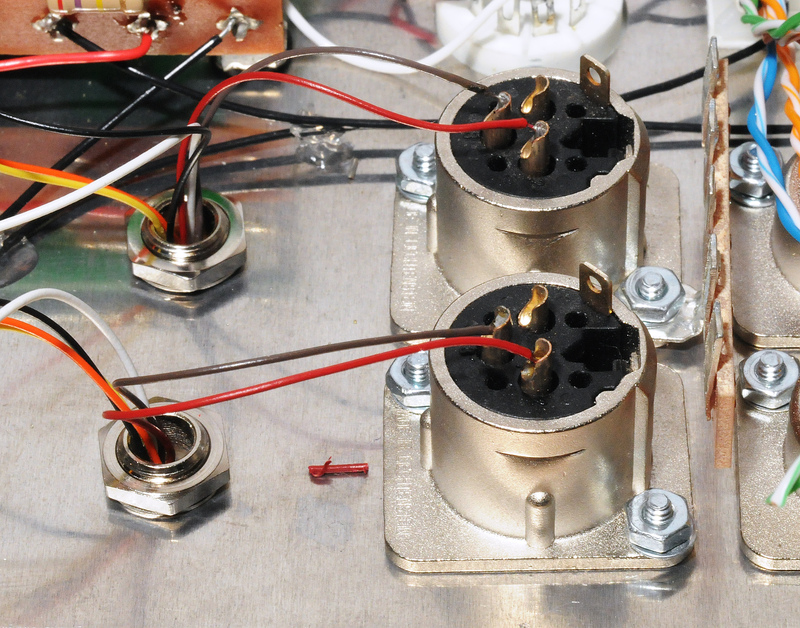 This project is far simpler than any kit we offer, or ever will offer. 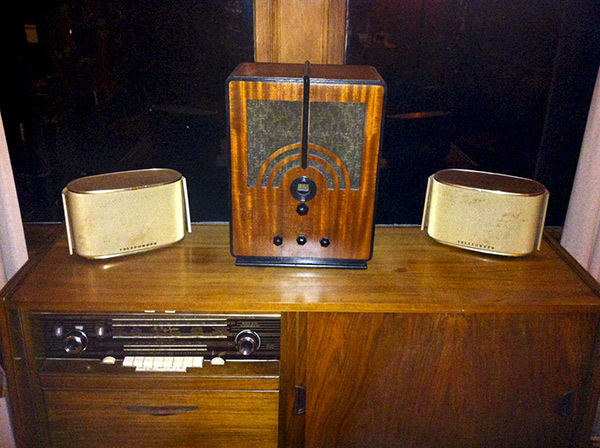 It would make a great warmup project for a first timer, or just a useful thing to have around an audio house. It’s a little hard to discern when you look at the Bottlehead Products web page, but there is a sort of logic to the various choices in each product category. We have, more or less, four levels of gear. The entry level includes the Quickie battery powered tube preamp, the Quicksand battery powered solid state amp, and the Fix baffle step corrector and treble compensator for small monitors. These are all very easy to build kits that are assembled on acrylic panels. Since they are battery powered they can make a great off-the-grid setup for a vacation cabin or maybe that killer system you have always wanted to attach to your Burning Man moving sculpture. Don’t let the low prices fool you, this is a legit setup with high fidelity. 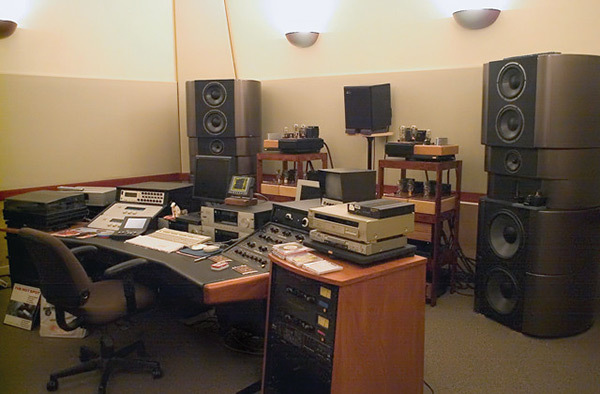 Could make a killer setup with some of Andrew Jones’ amazing budget speakers (the Pioneer or the ELAC versions), your own homebrew mini monitors, or your favorite headphones. For an entry level dedicated headphone amp that takes up less space than the system above we have the Crack output-transformer-less tube amp (OTL), designed specifically for high impedance headphones. OTL means we don’t need to include an output transformer in the design and hence the price can be lower than typical with-output-transformer designs. Use the Crack amp with high impedance cans like Sennheiser HD580/600/650 and Beyerdynamic DT880s and hear what everyone has been raving about. 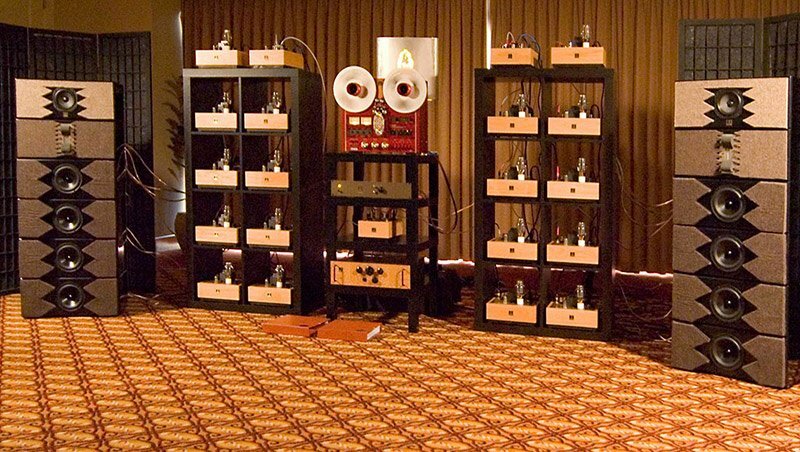 The mid level of kits includes the Reduction tube phono preamp, the Smash tube preamp, the Seductor stereo tube amplifier. These kits are AC mains powered and thus have power transformers and laser cut aluminum chassis panels that sit on alder bases. Reduction is designed to work well with moving magnet phono cartridges in the 5mV and higher output range, or moving coil cartridges with a suitable step up transformer. It will work very well with the Smash/Seductor combo. Smash has three inputs and can be upgraded with our most excellent sounding stepped attenuator upgrade called SmashQuiet. 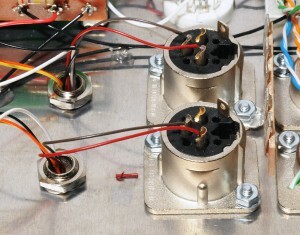 And Smash has two outputs that allow you to connect a subwoofer amp at line level. Seductor has about about 4wpc. Smash/Seductor would be killer with some mid priced high fidelity speakers like Blumenstein Orcas (try using Fix with this setup, yum). For high impedance headphone use only the new Crackatwoa amp offers a step up in sophistication from our best selling Crack OTL amp. 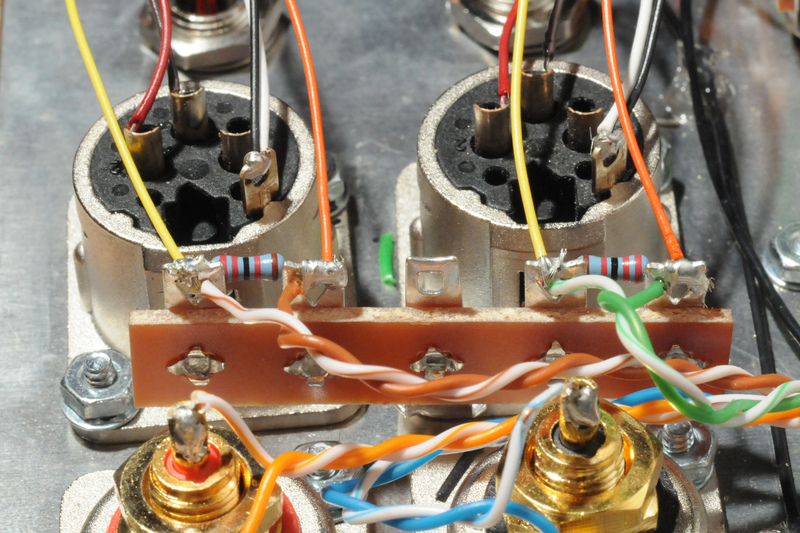 If you have a killer pair of high impedance cans and want to up their game, go Crackatwoa. The premium levels tube audio kits include The Eros phono and tape head preamps, BeePre preamp, the Kaiju 300B stereo/monoblock convertible amp, the StereomourII integrated 2A3 amp, and the Mainline headphone amp. For purists we also offer the Submissive passive controller. These kits are a little more involved to build than the mid level kits due to the greater sophistication of the design. Eros phono is designed to work well with moving magnet and high output moving coil cartridges and works wonderfully with low output moving coil cartridges with a suitable step up transformer. 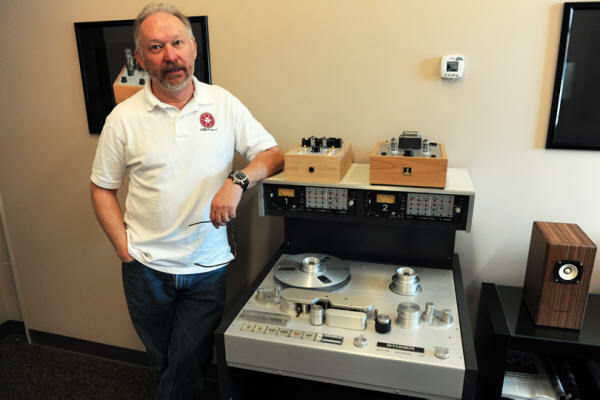 Eros tape head is designed to work with typical prosumer type playback heads such as those used in Technics, Otari, Tascam, etc. 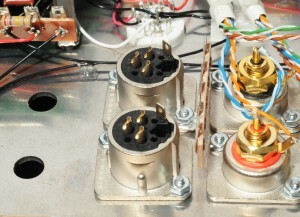 decks that have been rewired for direct head output. Both of these low level preamps work very well with the BeePre/300B amp combo, StereomourII and Mainline. What does the BeePre/Kaiju combo get you that StereomourII doesn’t? BeePre puts directly 300B heated tubes in the preamp stage and offers shunt voltage regulation, which in our experience contribute to the highest level of resolution. StereomourII uses the venerable 12AT7 tube for the preamp section and a less complex power supply. BeePre is also capable of being set up for XLR balanced inputs. And BeePre has two sets of output jacks and can be configured for XLR output. Kaiju has twice the power of Stereomour at 8wpc vs. 4wpc. Kaiju will also be capable of being strapped into a monoblock amp so that you can employ two Kaijus as 16wpc monoblocks for driving less efficient speakers. The BeePre/Kaiju combo can be configured with all DC powered filaments for a super low signal to noise level that works well with high efficiency horn speakers, as can StereomourII. StereomourII holds the distinct advantage of being much smaller than the BeePre/Kaiju combo if space is critical, while retaining a major fraction of the musical goods that BeePre/Kaiju deliver. These setups will work great with big horns, efficient open baffle setups and multi-way/multi-amp setups (Doc’s favorite kind of speaker setup, BTW). And what does Mainline do that Crack and Crackatwoa don’t? 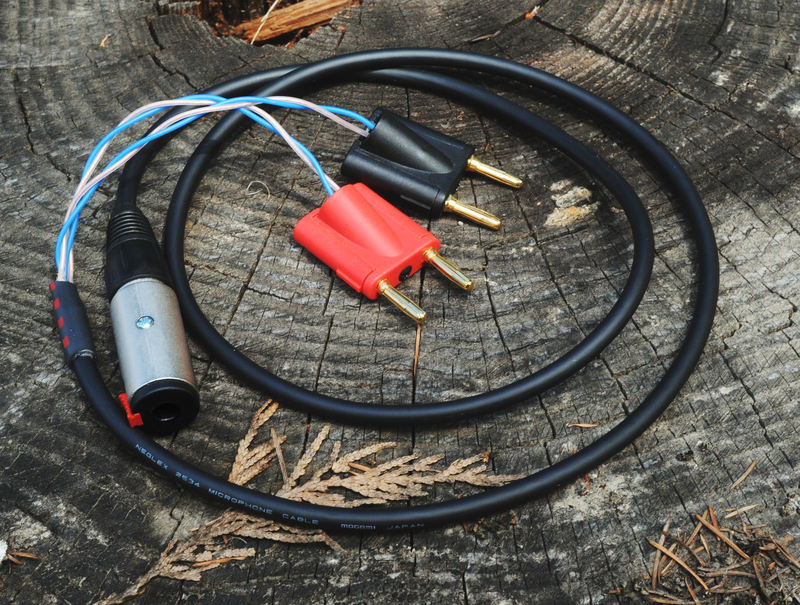 Mainline works with headphone of any impedance, and it has the highest resolution of the three amps. 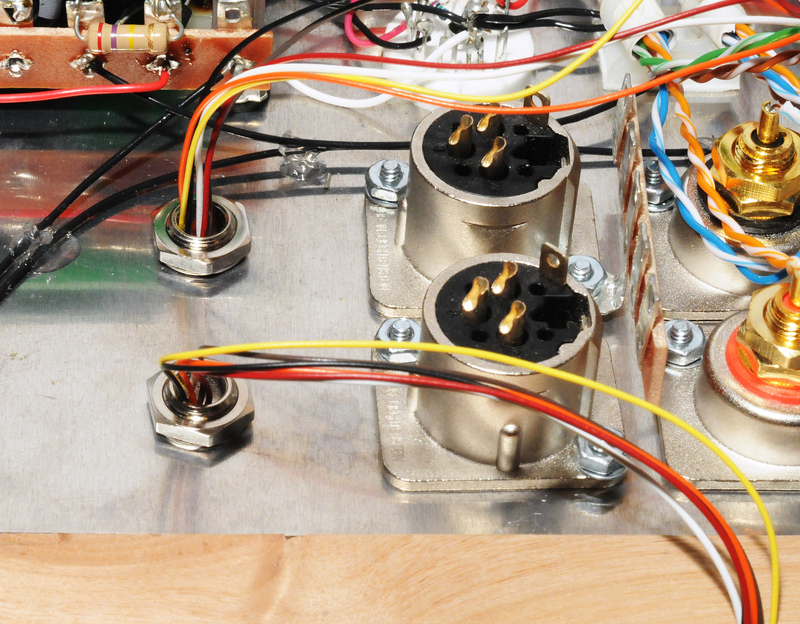 Part of this is due to the very linear single gain stage design and more sophisticated power supply. The other major factor is the employment of our unique coarse/fine stepped attenuator as offered in the BeePre, StereomourII and Smash kits. It is capable of running balanced headphone cables and will work with all but the most inefficient headphones (which we recommend the more powerful S.E.X. amp for). This amp is a great combo with premium headphones like HD800s, LCD-2s and T-1s. 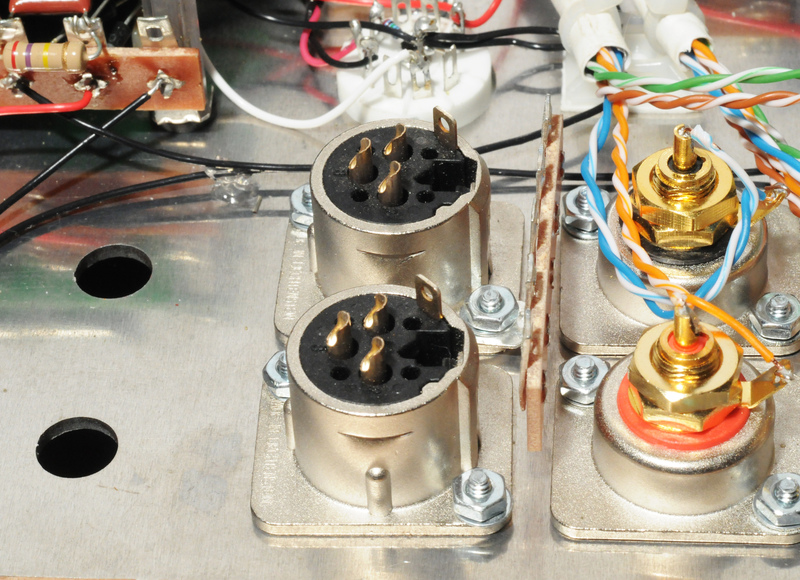 This level includes our Tube Repro tape head preamp, Tube Phono phono preamp and Neothoriator headphone amp. 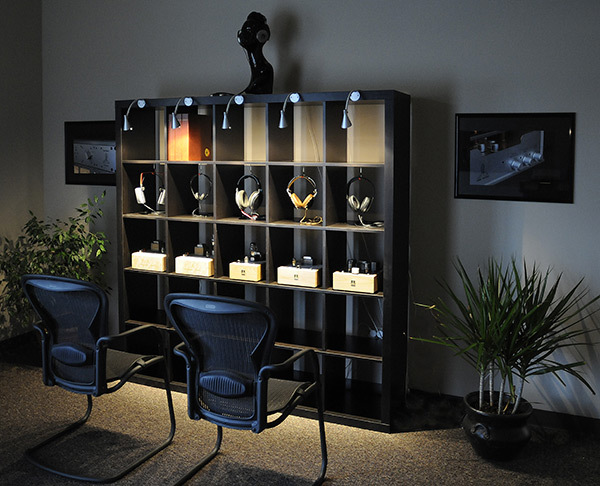 These finished products are built for you by our technicians and offer the highest level of sophistication and parts quality. Our premium level kit products will work very well with these finished products. But can I mix and match? Absolutely! You can sub a BeePre in for a Smash to use with a Seductor, and going the other way you could even use a Quickie with a Kaiju! However there are some guidelines to keep in mind. The Eros phono preamp has more gain than the Reduction phono preamp and might work better with lower output phono cartridges. Because of their clean and unencumbered design Eros and Reduction both have fairly high output impedance and thus the relatively low input impedance of the Submissive passive control might not work as well with those phono preamps as it would with a digital source that has a low impedance opamp output. The Smash preamp has more gain than Quickie or BeePre and might get a little touchy if used ahead of, say, a really sensitive solid state amp rather than one of our products. Also bear in mind that as the price level goes up, so goes up the power level of the power amps. One more general guideline is that kits within a specific level tend to share a lot of technology and thus sonic “equality”. Incorporating a kit from the next level down with kits from a level or two up might sacrifice a hair of resolution. The sound won’t be ruined by any stretch of the imagination, but you might not be getting every last ounce of performance the more sophisticated kits can deliver.